Moshood Abiola Polytechnic, MAPOLY National Diploma Part-Time and Higher National Diploma, Full-Time and Part-Time Programmes entrance examination dates have been announced – 2014/2015 academic session. 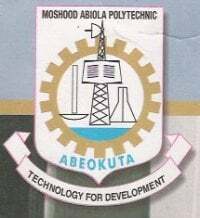 This is to inform all the candidates that applied for the Moshood Abiola Polytechnic (MAPOLY), Abeokuta various National Diploma Part-Time and Higher National Diploma, Full-Time and Part-Time Programmes that the authorities of the polytechnic has announced the date for the entrance examination. Authorities of Moshood Abiola Polytechnic, Abeokuta have announced Friday, 10th and Saturday, 11th October, 2014 as dates for entrance examination into all National Diploma Part-Time and Higher National Diploma, Full-Time and Part-Time Programmes of the Institution. The mandatory entrance examination which holds on the 10th and 11th of October, 2014 is for candidates who must have obtained the ND or HND Application forms and the entrance screening Form. Candidates are expected to check for their examination dates on the Institution’s website, and come with the print-out of both the application and entrance screening forms for the examination.